Adam David Brown, Silence, 2009, Pink Pearl eraser, dimensions variable. One of Adam David Brown’s achievements lies in his consistent ability to explore the expressive potential of highly reductive imagery. This exhibition features two colors—pink and white—and just a few shapes and letters. 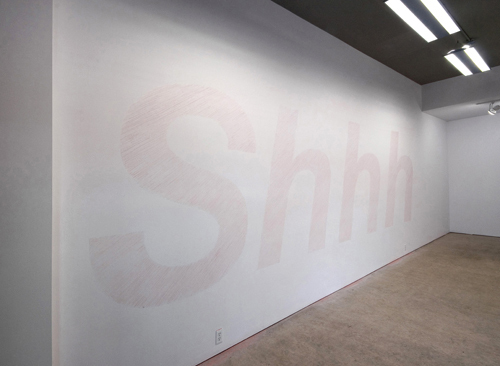 On entering the gallery, one is confronted by a mural-size drawing, Silence (all works 2009) that depicts the letters SHHHH. It is composed of Pink Pearl eraser applied arduously and directly to the wall using hundreds of diagonal strokes. The composition creates a palpable tension between a strongly evident labor process and an ephemeral medium that is conventionally used to eliminate mistakes rather than to make something of semantic interest or aesthetic purpose. Close inspection of the work’s delicate, striated surface—in combination with the odor of rubber residue—triggers regressive childhood memories of classroom writing exercises and of teachers hushing chatty students. While Silence signifies a Zen-like preoccupation with the ideas of quiet restraint and the impermanence of all living things, Avoir functions with more confidence as an unassailable commodity: This picture consists of two eraser drawings on paper—placed behind glass within a single frame—that both depict the letter I, which may be identified with the egocentrism of consumer culture, particularly when acknowledging one’s own presence atop the work’s reflective surface. Here the medium has more consistency as grainy powder and appears to have been applied with adhesive to ensure longevity. The duplication of the letter H or I implies the repeated and playful enunciation exercised by toddlers developing linguistic abilities. Brown’s elegant imagery best suggests the speculative activity of pronouncing single syllables belonging to a language that does not yet exist and that therefore cannot rely on the comforts of coherent sentences and narrative.